You don’t have to play alone! Bring a friend of two, find a game, order a drink, and get started! There isn’t a better way to spend a Friday or Saturday night out! Need some good old-fashioned family time? This is the best place to catch up with family, and have fun! What better way to reconnect with your family than over a board game? A little friendly competition is good for everyone! Put your gaming skills to the test! Whether you’re playing against friends or family, a little competition can be fun! 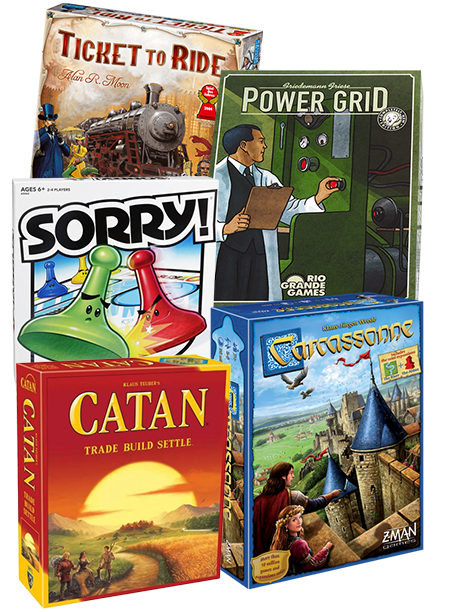 It doesn’t matter if you have a time limit or want to stay a while, The Sideboard has games for all needs, all ages, and all events. Our goal is to encourage playful engagement and interaction between friends, family, and even strangers. These days, it’s too easy to get lost in technology and other distractions. So sit back, order a refreshment, and play a game… like people used to do. Have fun and make memories the old-fashioned way. You won’t find anything else quite like The Sideboard. We offer coffee, craft beer, delicious food, and have more than 200 games on hand — some familiar and some brand new. We have more than enough space and tables for your group to spread out and get comfortable, as if you were in the comfort of your own living room. Choose from a wide variety of games — some that take minutes, others that take hours, some simple, and others more complex. Our staff knows every game inside and out, so don’t waste time figuring out the official rules — just ask a staff member for guidance. As long as you’re enjoying a coffee, beer, or snack, the game is on us. Come in and let the games begin! And remember, you don’t have to play a game to enjoy our cafe … it’s just an added bonus!